Easy to make Valentine Rice Crispy Treats perfect for your Valentine! 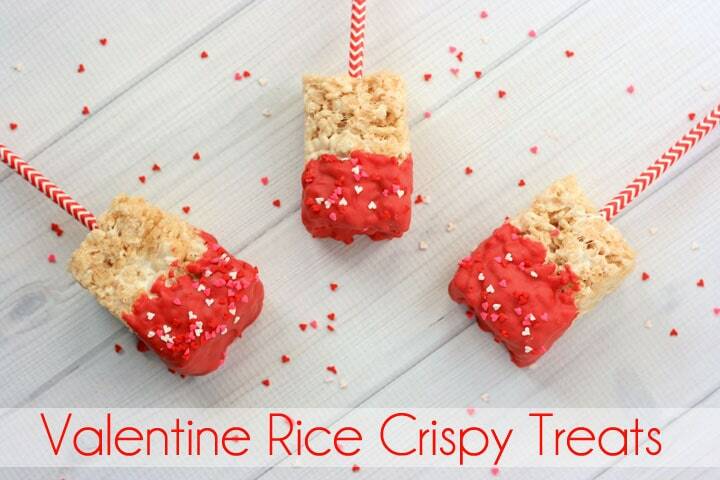 These Valentine Rice Crispy Treats are very simple to make. If you plan to have a Valentine’s Day party, this is a stress-free recipe and the other invitees will be impressed! You may also want to try my Strawberry Rice Krispies Teats Recipe. I went back and forth on the correct way for titling these tasty treats. Valentine Rice Crispy Treats or Valentine Rice Krispie Treats? To me they both work but it is always hard to tell which to use so this time, I decided on the “Crispy”. 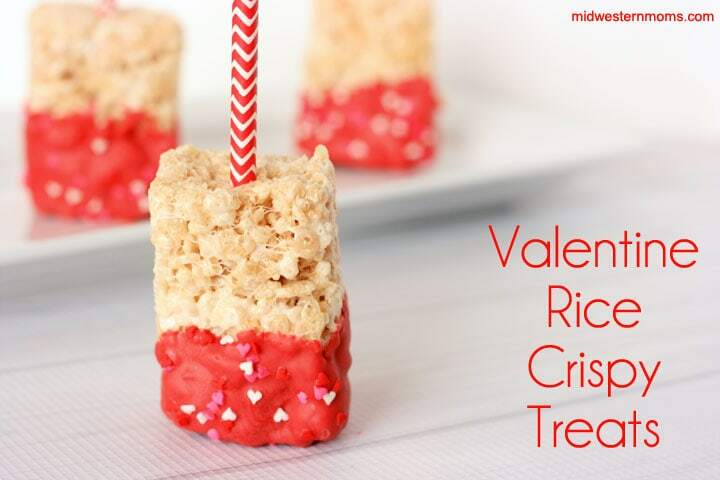 These Valentine Rice Crispy Treats are simple and people will love them! 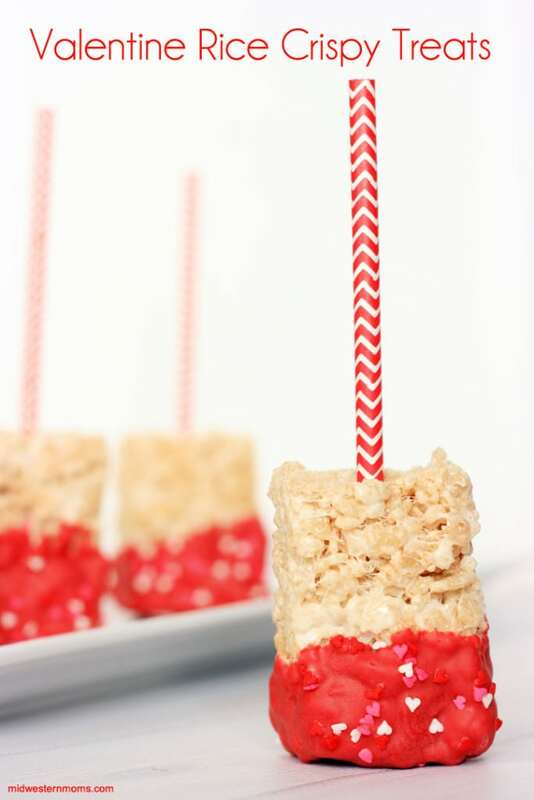 It is your traditional rice crispy treat recipe with candy melts , sprinkles, and paper straws added. An easy treat idea for celebrating Valentine’s Day! 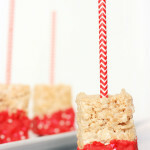 Simple Rice Crispy Treats dressed up with candy melts, sprinkles, and paper straws. Perfect for your Valentine or party. Add the vanilla extract and bag of mini marshmallows. Stir until melted. Add the cereal. Stir until coated with the melted marshmallows. Transfer to a greased 8 x 8 pan. Allow to cool and cut into rectangles. Melt the candy melts according to the package. Dip one end of the treats into the candy melts. Shake to help get the “extra” off. Lay onto wax paper to allow to cool. Before the candy melts harden, add the sprinkles. Once the candy melts have hardened, stick the paper straw into the end of the treat without the candy melt coating. Amount of treats will depend on how you cut them.